The Pattern Corrections utility allows users to quickly create machining models, casting patterns, and molds directly from PropCad, reducing the manual manipulation of the surfaces in general purpose CAD tools! HydroComp’s Pattern Corrections allows users to directly specify machine stock and shrinkage to create machining models, casting patterns, and mold geometries. 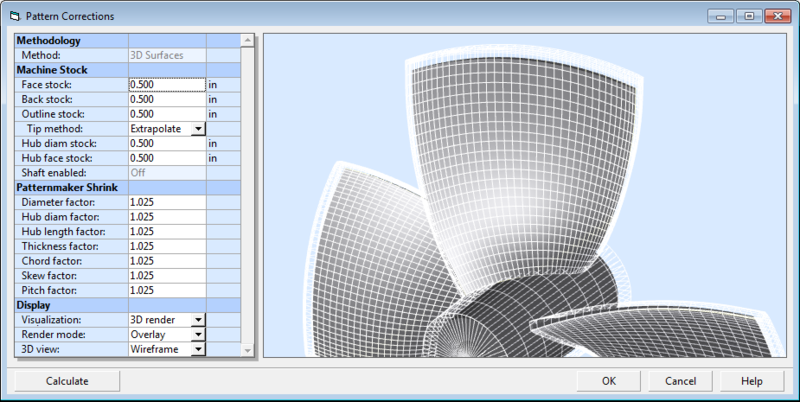 A major advantage is that these corrections are applied directly to the propeller parameters, allowing calculation and visualization of sections, blade parameters, and radial distributions. The Pattern Corrections utility also allows users to document these corrections and saves them to the original design file. Consequently, adjustments to the pattern can be made rapidly and easily. Design geometry – This is the geometry of the final, finished propeller. This model can be used to produce the “drive surfaces” for CNC machining. Machining geometry – This is the geometry of the propeller that includes extra material for machining via milling or grinding operations. This model is often used as the “stock model” for CNC machining operations performed on propeller castings. Pattern geometry – This geometry (also known as a casting geometry) is used to create the propeller mold. It includes the extra material for machining, and also includes “shrinkage factors” that correlate to the reduction in size that occurs when the molten material used to pour the propeller cools and solidifies.